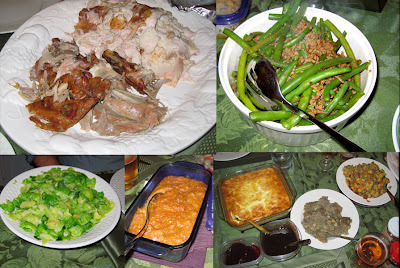 Thanksgiving dinner is such an ordeal anymore since Mr Minx and I basically act as caterers. I miss the days when we could lounge around in our pajamas and watch the Macy's Thanksgiving Parade before leisurely packing up and heading to our dinner destination! Things have changed, however, and for the past two years we've headed over to my brother-in-law's at 9am in order to get the poultry started. After last year's duo of turkey, I decided that this year I would instead make duck. Oh, and a turkey breast. But first, the duck. I used Sally Schneider's recipe from A New Way to Cook, minus the thyme, because I wanted to serve the meat like Peking duck, with tortillas in place of Chinese pancakes, plus hoisin sauce and scallions. Looks like the real thing, no? Oh yeah - I forgot the turkey breast. Despite my dislike for turkey, I have to admit that this was pretty good. Mr Minx found a recipe for grilled turkey in a Steven Raichlen book; it involved injecting the beast with a mixture of chicken stock and Cajun seasoning, and cooking it over indirect heat with a packet of wood chips. The resulting body part was wonderfully moist and juicy with a subtle smoky flavor. I'll admit I would have eaten it, were it not for the duck. Saute the giblets (except the livers) in 1 tablespoon butter until browned on all sides, about 10 minutes. Add livers and cook an additional five minutes. Allow to cool and chop finely. Preheat a large skillet over medium high heat. Add olive oil and remaining butter to skillet. When butter melts, add celery, onion, leek, mushrooms, and carrots. Sprinkle with salt and pepper, cover skillet, and cook 15-20 minutes until vegetables soften, then add scallions and giblets to the pan and combine. Place the bread cubes in a large bowl with vegetables. Moisten the dressing with stock until all of the bread is moist but not wet (you may not need all of the stock). Spray a 9 x 13 baking dish with release spray. Pour in dressing and do not smooth top (you want more nooks and crannies for more crunch). Bake, covered, 30 minutes. Remove foil and bake an additional 15 minutes to crisp top. Mix together all ingredients. Refrigerate until ready to use. Place ingredients in a medium saucepan. Cook, stirring occasionally, over medium heat until the cranberries have popped and the sauce has thickened, 10 minutes. Pour into a bowl or other glass container and refrigerate until chilled. Serve cold. Sorry 'bout your ordeal, but these dishes look lovely! 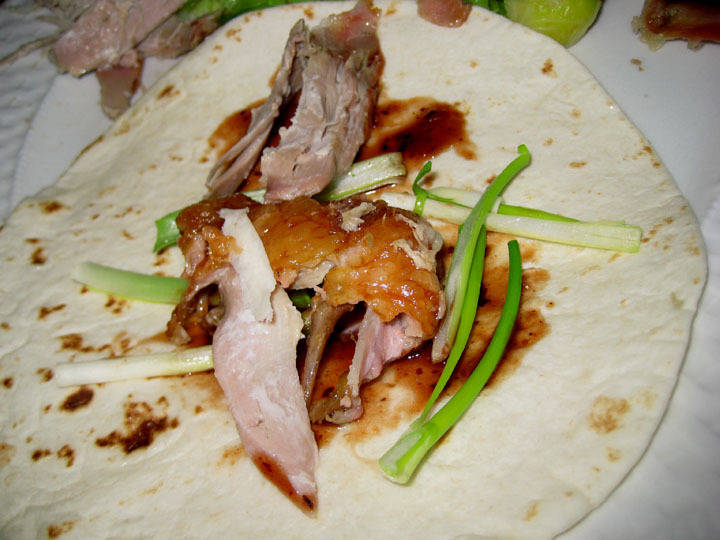 duck, with tortillas in place of Chinese pancakes, plus hoisin sauce and scallions.